Amsterdam, located in the south of the province North Holland in the Netherlands, was founded in the late 12th century as a small fishing village at the mouth of the River Amstel. The city, which has the largest historical city center of Europe, is known for its deeply religious past. Both Catholicism and Protestantism flourished here even during the devastating and infamous Spanish Inquisition. Jews from Spain and Portugal, prosperous merchants from Antwerp (economic and religious refugees from the part of the Low Countries still controlled by Spain), and Huguenots from France who were persecuted for their religion, sought safety in Amsterdam. During the age of colonial adventurism, Holland was a bastion of Christian morality. The 1960s and 1970s saw a cultural revolution, with Amsterdam at the center. The use of soft drugs was tolerated, making the city a popular destination for hippies. It soon became famous for its red-light district and cannabis coffee shops. The city has a long tradition of toleration, which was put to the test with the 2004 murder of Dutch film-maker Theo van Gogh following the release of a 10-minute film he created ("Submission") which dealt with the topic of alleged violence against women in Islamic societies. Amsterdam continues to be tested by religious and ethnic pressure brought by waves of immigration in the late-twentieth century. Anne Frank, the young Jewish refugee who died in Bergen-Belsen, though German-born, spent two years in hiding in Amsterdam during the Nazi occupation. The Diary of Anne Frank is her record of those two years. Amsterdam began as a fishing village in the late twelfth century. The damming of the river Amstel gave it its name (in Dutch: Amstelredam "Dam in the Amstel," turned into Amsterdam in the course of time). The traditional founding of the city is October 27, 1275, when the inhabitants living around the Amstel dam were granted freedom from paying the tolls associated with the locks and bridges of Holland. It was given city rights in 1300 or 1301. From the fourteenth century on, Amsterdam flourished on the basis of trade with the cities of the Hanseatic League. In 1345, a Eucharistic miracle occurred near the Kalverstraat and Amsterdam would remain an important pilgrimage city until the Protestant Reformation; today the Stille Omgang—a silent procession in civil dress—remains of the rich pilgrimage history. In the sixteenth century, the Dutch rebelled against Philip II of Spain and his successors. The revolt escalated into the Eighty Years' War, which ultimately led to Dutch independence and the imposition of Protestant Calvinism as the de facto state religion. In 1578, the previously Catholic city of Amsterdam joined the revolt and all churches were confiscated for the reformed Protestant worship. After the break with Spain, the Dutch Republic became known for its relative religious tolerance, except towards Catholics who were forced to worship secretly. Jews from Spain and Portugal, prosperous merchants from Antwerp (economic and religious refugees from the part of the Low Countries still controlled by Spain), and Huguenots from France (persecuted for their religion) sought safety in Amsterdam. The seventeenth century is considered Amsterdam's "Golden Age." In the early seventeenth century, Amsterdam became one of the wealthiest cities in the world. Ships sailed from Amsterdam to the Baltic Sea, North America, Africa, and present-day Indonesia and Brazil, and formed the basis of a worldwide trading network. Amsterdam's merchants had the biggest share in the Dutch East India Company and Dutch West India Company. These companies acquired the overseas possessions which formed the seeds of the later Dutch colonies. Amsterdam was the most important point for the trans-shipment of goods in Europe, and it was the leading financial center of the world. Amsterdam's stock exchange was the first to trade continuously. The eghteenth and early nineteenth centuries, wars between the Dutch Republic and England and France took their toll on Amsterdam, especially the Napoleonic Wars, until the establishment of the Kingdom of the Netherlands in 1815, the situation slowly began to improve. 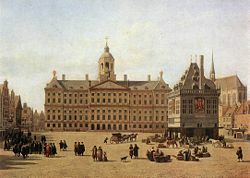 Dam Square in the late seventeenth century: Painting by Gerrit Adriaensz. Berckheyde (Gemäldegalerie, Dresden). 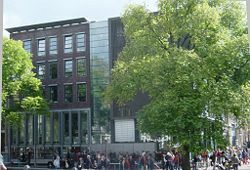 In 2005, 965,000 people visited the museum adjoining #263 Prinsengracht, better known as the Anne Frank House. The end of the nineteenth century is sometimes called Amsterdam's second Golden Age. New museums, a train station, and the Concertgebouw were built. At this time the Industrial Revolution reached Amsterdam. The Amsterdam-Rhine Canal was dug to give Amsterdam a direct connection to the Rhine, and the North Sea Canal to give the port a shorter connection to the North Sea. Both projects improved communication with the rest of Europe and the world dramatically. Shortly before the First World War, the city began expanding and new suburbs were built. During the war, the Netherlands remained neutral. Amsterdam suffered a food shortage, and heating fuel became scarce. The shortages sparked riots in which several people were killed. Nazi Germany invaded the Netherlands on May 10, 1940, taking control of the country after five days of fighting. The Germans installed a Nazi civilian government that cooperated in the persecution of Jews, although some Dutch people helped hide Jews and suffered persecution themselves. More than 103,000 to 105,000 Jews were deported from the Netherlands to Nazi concentration camps, of whom perhaps the most famous was a young German girl, Anne Frank. Only 5,000 Dutch Jews survived the war. In the last months of the war, communication with the rest of the country broke down, and food and fuel became scarce. City dwellers scoured the countryside to collect food. Dogs, cats and raw sugar beets were eaten. Most of the trees in Amsterdam were cut down for fuel, and all the wood was taken from the apartments of the Jewish people who were deported. The 1960s and 1970s, cultural revolution made Amsterdam the magisch centrum (magical center) of Europe. The use of soft drugs was tolerated and this policy made the city a popular destination for hippies. Anarchist squatters wanted to change society by squatting empty buildings, leading to clashes with contractors, who were aligned with the Dutch Mafia. In 1980, while Queen Beatrix's coronation was being held in the New Church on Dam square, protesters outside the church fought with police in protest against government policies. The mayor and city council eventually had to bring in the military to get the situation under control. During the 1980s, large numbers of immigrants from Suriname, Turkey, and Morocco drove ethnic Dutch inhabitants to the "growth cities" of Purmerend, Almere, and other cities near Amsterdam. Neighborhoods like the Pijp and the Jordaan, which had previously been working class, became sought-after places of residence for the newly wealthy yuppies and students. In 1992, an El Al cargo plane crashed in the Bijlmermeer in Amsterdam Zuidoost. This disaster, which became known as the Bijlmerramp, killed at least 43 people. At the beginning of the millennium, social problems such as safety, ethnic discrimination, and segregation between religious and social groups began to develop. Amsterdam's characteristic tolerance was put to the test with the murder of Dutch film-maker Theo van Gogh on November 2, 2004, by a Mohamed Bouyeri, an Islamic fundamentalist. The murder followed the release of a 10-minute movie named Submission, which dealt with the topic of alleged violence against women in Islamic societies. The mayor of Amsterdam, Job Cohen, and his alderman for integration, Ahmed Aboutaleb, formulated a policy of "keeping things together" which involves social dialogue, tolerance, and harsh measures against those who break the law. 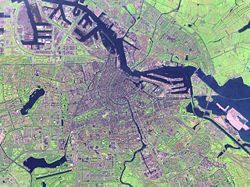 Satellite image of the central part of the urban area of Amsterdam. 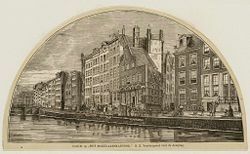 A woodcut (1885) of the Nieuwezijds Voorburgwal, a canal that is now a filled up. The city of Amsterdam is located on the banks of the rivers Amstel and Schinkel, and the bay IJ. 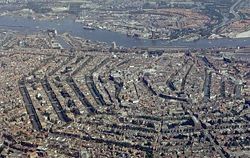 Several parts of the city and of the urban area are polders, recognizable by their postfix -meer meaning "lake," such as Aalsmeer, Bijlmermeer, Haarlemmermeer, and Watergraafsmeer. Amsterdam has a moderate temperate climate, with the weather patterns strongly influenced by proximity to the North Sea and its prevailing northwestern winds and gales. Winter temperatures are mild, reaching 32.9°F (.5°C) in January. Frosts occur during spells of easterly or northeasterly winds blowing in from the inner European continent—from Scandinavia, Russia, and even Siberia. Summers are warm but rarely hot, reaching 70.5°F (21.4°C) in July. Amsterdam averages less than 760 mm of precipitation annually, most of which falls as protracted drizzle or light rain. Cloudy and damp days are common, particularly in cooler months, October through March. The inner city is divided by its network of canals into some 90 “islands,” and the municipality has approximately 1300 bridges and viaducts. The canal system is the result of conscious city planning that took place in the early seventeenth century, when immigration was at a height. A comprehensive plan was based on four concentric half-circles of canals with their ends resting on the IJ bay. Known as the Grachtengordel, three of the canals were mostly for residential development: The Herengracht (Gentleman's Canal), Keizersgracht (Emperor's Canal), and Prinsengracht (Prince's Canal’). The fourth and most outer canal, the Singelgracht (not to be confused with the Single), was for defense and water management, achieved by moat and earthen dikes, with gates at transit points. Construction began in 1613 and proceeded from west to east, across the breadth of the lay–out. Southern sector canal constructions were completed by 1656. The eastern part of the concentric canal plan, covering the area between the Amstel river and the IJ bay, has never been implemented. The land was used for parks, senior citizen homes, theaters, other public facilities, and waterways without much planning. Over the years, several canals have been filled up becoming streets or squares, such as the Nieuwezijds Voorburgwal and the Spui. The urban area includes the municipalities: Aalsmeer, Amsterdam, Amstelveen, Diemen, Haarlemmermeer, Ouder-Amstel, Uithoorn, and Waterland. The size of the urban area (land only) was 277.2 square miles (718.03 km²). The metropolitan area consists of the urban area, its satellite cities, and the intervening rural land that is socio-economically connected to Amsterdam. The total size of the metropolitan area (land only) was 558.8 square miles (1,447.36 km²). Amsterdam is governed by a mayor, aldermen, and the municipal council, as are all Dutch municipalities. 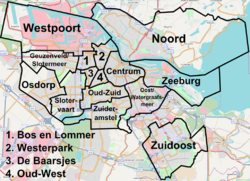 However, unlike most others, Amsterdam is subdivided into 15 stadsdelen (boroughs), a system that was implemented in the 1980s to improve local governance. The stadsdelen are responsible for many activities that previously had been run by the central city. Fourteen of these have their own council, chosen by a popular election. The fifteenth, Westpoort, covers the harbor of Amsterdam, has very few inhabitants, and is governed by the central municipal council. Local decisions are made at borough level, and only affairs pertaining to the whole city, such as major infrastructure projects, are handled by the central city council. The municipality is responsible for public transport, municipal grounds and buildings, health, housing, electricity and gas, the port, markets, police, the fire service, sanitation, social services, waterworks, education, and churchyards. The city has banks, an advertising department, a print shop, swimming pools, theater, archives, museums, slaughterhouse, and an orphanage. Although Amsterdam is officially designated as the capital of the Netherlands, it has never acted as such, save a brief period between 1808 and 1810. The seat of the supreme court, government, or parliament of the Netherlands, are all located at The Hague. Amsterdam is also not the capital of the province in which it is located, North Holland, whose capital is located at Haarlem. 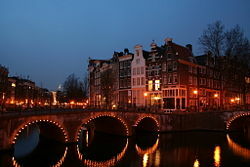 Amsterdam is the financial and business capital of the Netherlands, and, in 2007, was one of the best cities in Europe to locate an international business in. It is ranked fifth in this category, surpassed by London, Paris, Frankfurt, and Barcelona. With a GDP of $42-billion in 2005, Amsterdam ranked the 95th largest city in the world. 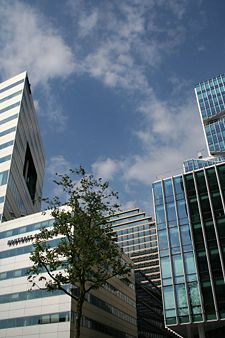 Many large Dutch corporations and banks have their headquarters in Amsterdam, including ABN Amro, Heineken, ING Group, Ahold, Delta Lloyd Group, and Philips. KPMG International's global headquarters is located in nearby Amstelveen, as is the European headquarters of Cisco Systems. The South Axis (Dutch: Zuidas) is increasingly a banking area, and is intended to become the new business-face of the Netherlands. The five largest law firms of the Netherlands and Dutch subsidiaries of large consulting firms like Boston Consulting Group and Accenture have their offices there, and the World Trade Center Amsterdam stands there. Three smaller financial districts are the area surrounding [[Amsterdam Sloterdijk railway station, the area surrounding Amsterdam Arena, and the area surrounding Amsterdam Amstel railway station. 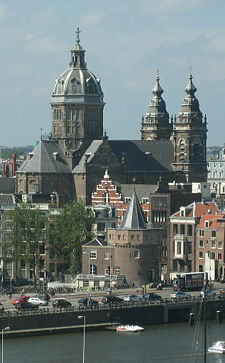 The highest building in Amsterdam (Rembrandttoren) is situated there and it is the location of the headquarters of Philips. Amsterdam is the fifth busiest tourist destination in Europe with more than 4.2 million international visitors. This number of visitors has been growing rapidly and steadily over the past decade, with 74 percent traveling from elsewhere in Europe, and 14 percent from the United States. Retail stores range from large department stores such as Metz & Co, founded in 1740, De Bijenkorf founded in 1870, and Maison de Bonneterie a Parisian style store founded in 1889, to small specialty shops. Amsterdam's high-end shops are found in the streets Pieter Cornelisz Hooftstraat and Cornelis Schuytstraat. One of Amsterdam's busiest high streets is the narrow, medieval Kalverstraat in the heart of the city. Another shopping area are the Negen Straatjes: Nine narrow streets within the Grachtengordel, the concentric canal system of Amsterdam. The Negen Straatjes differ from other shopping districts by displaying a large diversity of privately owned shops. The city features also a large number of open-air markets such as the Albert Cuypmarkt, Westermarkt, Ten Katemarkt, and Dappermarkt. Ten percent of the workforce is involved in manufacturing. Activities include shipbuilding and heavy engineering, petrochemicals, food processing, brewing, and diamond polishing. International trade and transport accounts for 20 percent of the workforce. Amsterdam is a major hub of the highway system of the Netherlands. The A10 Ringroad surrounding the city connects Amsterdam with the Dutch national network of freeways. Parking fees are steep and a great number of streets are closed to cars or are one-way. The local government sponsors carsharing and carpooling initiatives. Public transport in Amsterdam, operated by Gemeentelijk Vervoerbedrijf, Connexxion, and Arriva consists of bus and tram lines. Amsterdam has three metro lines, a fourth line, the North/South line, being under construction. Several ferries exist, operating for pedestrians and cyclists across the IJ free of charge. Amsterdam is known as one of the most bicycle-friendly cities in the world. Most main streets have bike paths, bike racks are ubiquitous, and there are about 700,000 bicycles in the city. Each year, about 80,000 of them are stolen and 25,000 end up in the canals. Amsterdam is served by eight stations of the Nederlandse Spoorwegen (Dutch Railways). Five are intercity stops: Sloterdijk, Zuid, Amstel, Bijlmer ArenA, and Amsterdam Centraal. Amsterdam Schiphol Airport, which is less than 20 minutes by train from Amsterdam Central Station, is the biggest airport in the Netherlands, the fourth largest in Europe and the 10th largest in the world. It handles about 42 million passengers a year and is home base to KLM, since 2004 part of Air France-KLM. The World Trade Center Amsterdam is located in the financial district Zuidas. New development on the southern IJ-embankment. Old and new trams in front of Amsterdam Centraal. Amsterdam had a population of 743,027 inhabitants in 2006, and was by population size the largest city in the Netherlands. The urban area had a population of 1,209,419 inhabitants and is part of the conglomerate metropolitan area Randstad, with a population of 6,659,300 inhabitants, while the metropolitan area had a population of 2,191,259 inhabitants. Ethnic Dutch make up 83 percent of the population of the Netherlands, while others make up 17 percent, of which 9 percent are non-Western origin mainly Turks, Moroccans, Antilleans, Surinamese, and Indonesians. A total 45 percent of the population of Amsterdam has non-Dutch parents. Large social groups are people from Surinam, the Dutch Antilles, Morocco, and Turkey. Amsterdam's largest religious group are the Christians—Roman Catholic 31 percent, Dutch Reformed 13 percent, Calvinist 7 percent—followed by Islam 5.5 percent (mainly Sunni Islam), other 2.5 percent. A large group of 41 percent claim no religious affiliation. Official languages are Dutch and Frisian. Amsterdam has two universities: The University of Amsterdam (Universiteit van Amsterdam), and the Free University (Vrije Universiteit). There is an art school, De Rietveldacademie, the Hogeschool van Amsterdam and the Amsterdamse Hogeschool voor de Kunsten. Amsterdam's International Institute of Social History is one of the world's largest documentary and research institutions. Amsterdam's Hortus Botanicus, founded in the early 1600s, is one of the oldest botanical gardens in the world, with many old and rare specimens, amongst them the coffee plant that served as the parent for the entire coffee culture in Central and South America. Amsterdam has quality public and private primary schools, including Montessori schools, as well as Roman Catholic, Protestant denominations,and Muslim schools. The city has three independent grammar schools (Dutch: gymnasia), the Vossius Gymnasium, Barlaeus Gymnasium and St. Ignatius Gymnasium, where a classical curriculum including Latin and classical Greek are taught. Leaning buildings are common in Amsterdam. Amsterdam has more then 7500 protected monuments, and has the largest historical city center in Europe. 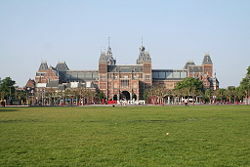 The most important museums of Amsterdam are located on het Museumplein (Museum Square), the largest square of Amsterdam, which lies adjacent to the southern side of the city's center. It was created in the last quarter of the nineteenth century on the grounds of the former World Exposition. The northern part of the square is bordered by the large Rijksmuseum. In front of the Rijksmuseum on the square itself you can find a man-made pond. This is transformed in winter time into an ice rink. The western part of the square is bordered by the Van Gogh Museum, which houses the largest collection of Van Gogh's paintings and drawings in the world, the Stedelijk Museum, House of Bols Cocktail & Genever Experience and Coster Diamonds. The southern border of the Museum Square is the Van Baerlestraat, which is a major thoroughfare in this part of Amsterdam. The Concertgebouw, the home of its world-class symphony orchestra, the Concertgebouworkest, is situated across this street from the square. To the east of the square are situated a couple of villas, one of which houses the American Consulate. The main theater building is the Stadsschouwburg Amsterdam at the Leidseplein, the home base of the Toneelgroep Amsterdam. The opera house is situated adjacent to the city hall. Therefore, the two buildings combined are often called the Stopera. This word is derived from the Dutch words stadhuis (city hall) and opera. 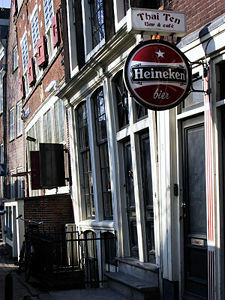 Amsterdam is also famous for its red-light district, de Wallen. Window prostitution is legal in the Netherlands at specific places. The red-light district is located in the center of the city along major canals and is clearly marked on maps. Amsterdam has a vibrant and diverse nightlife scene, which it is famous for. The two main epicenters for nightlife are the Leidseplein and Rembrandtplein. Amsterdam contains numerous cafes. Passersby can sit down in a old fashion cafe, which are called a bruin kroeg by Dutchmen. Centered around the Wallen, but also elsewhere in the city, coffee shops sell cannabis. This is not completely legal, but is tolerated when small quantities of cannabis (up to 5 grams) are involved. Amsterdam is a city of festivals—up to 140 a year. On Koninginnedag (Queensday), hundreds of thousands of people travel to Amsterdam to join the celebrations. During Gay Pride, there is a very long parade of boats with extravagant people floating on Amsterdam's canals. The Uitmarkt is a cultural event which lasts three days. It consists of many podia holding numerous artists, such as musicians and poets. Amsterdam also is home to a famous ice rink, the Jaap Eden baan. The Amstel Tijgers play in this arena in the Dutch ice hockey premier league. In speed skating many international championships have been fought in the 400-meter lane of this ice rink. ↑ Kerncijfers voor Amsterdam en de stadsdelen. www.os.amsterdam.nl. Research and Statistics Service, City of Amsterdam (1 January 2006). Retrieved April 4, 2007. ↑ Actueel Hoogtestand Nederland (in Dutch). Retrieved May 18, 2008. ↑ Population (in Dutch). Themes. City of Amsterdam (October 2008). Retrieved March 8, 2009. Berns, Jan. Daan, Jo. 1992. Hij zeit wat. De Amsterdamse volkstaal. BZZTôH. The Hague. ISBN 90-629-756-9. Dorrestein, Renate, Koen Kleijn, and Harold Strak. 2006. Behind the Façades: Gardens of the Canal Houses in Amsterdam. Amsterdam: Architectura & Natura. ISBN 9789076863344. Encyclopaedia Britannica Online. Amsterdam. Retrieved June 30, 2008. Mak, Geert. 2000. Amsterdam. Cambridge, Mass: Harvard University Press. ISBN 9780674003316. Roegholt, Richter. 2006. A short history of Amsterdam. Amersfoort: Bekking & Blitz. ISBN 9061095522. Taverne, E.R.M. 1978. In ‘t land van belofte, in de nieue stadt: ideaal en werkelijkheid van de stadsuitleg in de Republiek, 1580-1680 (In the Land of Promise, in the New City: Ideal and Reality of the City Lay-Out in the [Dutch] Republic, 1580-1680). Maarssen. ISBN 90-6179-024-7. This page was last modified on 16 March 2016, at 17:00.